As part of ISA activity,the students of Middle Department presented on December 13, 2017 a special Morning Assembly on the theme 'International Day of Human Rights'. The main highlight of the program was organisation of a session of United Nations General Assembly on the issue of Gender Equality by a group of eight girls of Class VIII. Next about twenty students of class VI listed and explained the basic human rights through a colorful display. A Play was also enacted by about twenty five students to bring out the importance of human rights. For this four rights viz. Right to Education , Freedom of Speech and expression , Freedom of Religion and Freedom from Discrimination were selected. The program ended with an oral presentation by a student of class VIII on the need and importance of celebrating Human Rights Day followed by a poem 'In the True Spirit'. 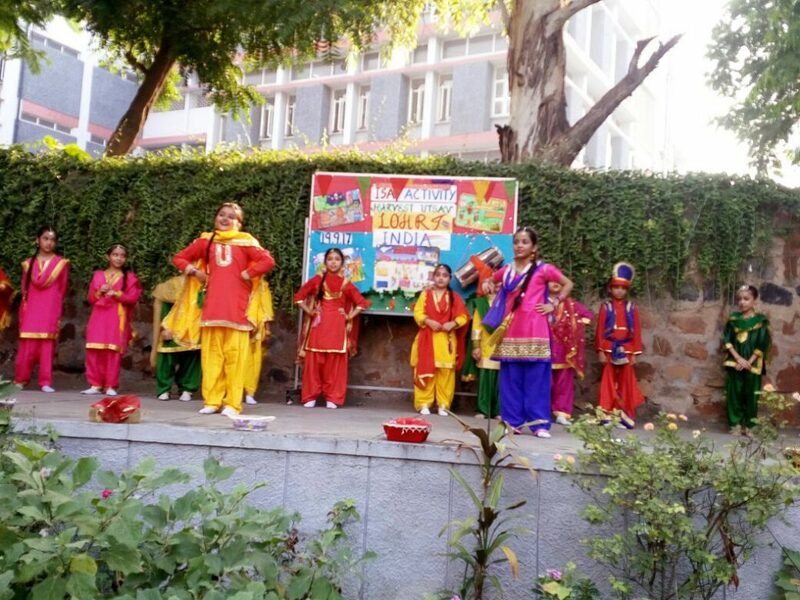 To foster global learning and life skills, a mosaic of “Sojourn” was presented by the students of ICC, Bal Bharati Public School, GRHM in the month of October and November. The young travellers delved in collaborative learning and presented enriching ‘PPT Presentations’ ,prepared ‘Life-Size Models’, ‘Infomercial Brochures’ and ‘Collages’ focusing on the uniqueness of the selected cities. The students not only voiced their opinions in Declamation Competition but also made their efforts acknowledged and appreciated by all. To culminate the project-'Harvest Utsav' taken up by the Primary Department , Pusa Road Campus, the final activity was organised on 31 October, 2017 in the school auditorium, GR Campus. Ms. Rama Maheshwari, an educationist graced the occasion along with the Principal Mr. L.V Sehgal, Officiating Vice Principal Ms. Meena Malhotra , Headmistresses, Dr Sunita Gehani & Ms. Neelam Ahuja, Chief Coordinator Ms Poonam Sondhi, Members of the Parent Teacher Association and parents of the participants. The programme commenced with lighting of the lamp followed by a prayer by the school choir of the Primary Department, GR Campus. Some students then shared their experience about the impact of various ISA activities organised in the school in the session 2017-18. They joyfully expressed how these activities have enlightened and apprised them of the culture and traditions of different counties in the world with a special focus on harvest festivals .The cultural programme organised on the occasion focused on the Moon Festival of China and included a musical enactment of the legend related to the festival. 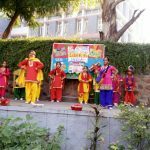 71 students of class II and III dressed up in vibrant costumes presented this musical extravaganza and enlightened all about the customs and traditions related to the festival. The chief guest in her address appreciated the efforts of the students, teachers and parents. The enthralling performance by the students was applauded by all. A special ISA Assembly was organised by the Primary Department, Pusa Road Campus on 19.9.17. 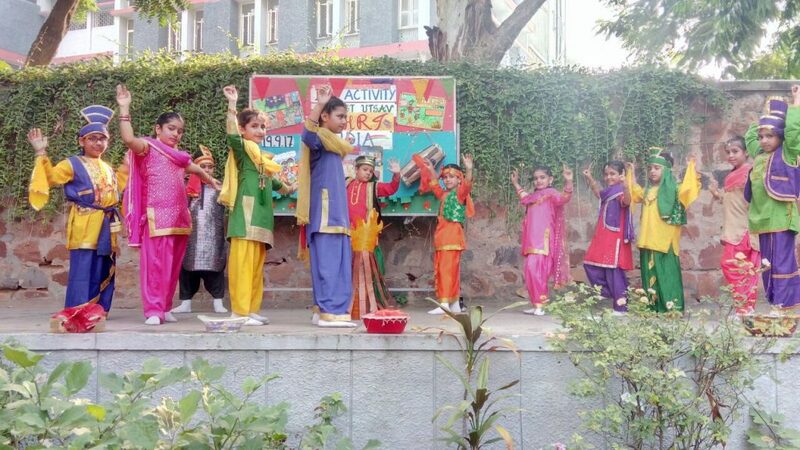 The assembly was a part of the ISA Project – ‘Harvest Utsav’ in which the students are exploring and learning about the harvest festivals celebrated in Africa, India and China. The theme for the assembly was Lohri- the harvest festival celebrated in India. 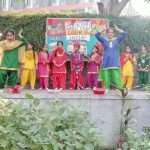 The students were enlightened about the different traditions and rituals related to the festival of Lohri through a colourful and vibrant presentation which included enactment of the legend of ‘Dulla Bhatti’ associated with the festival. 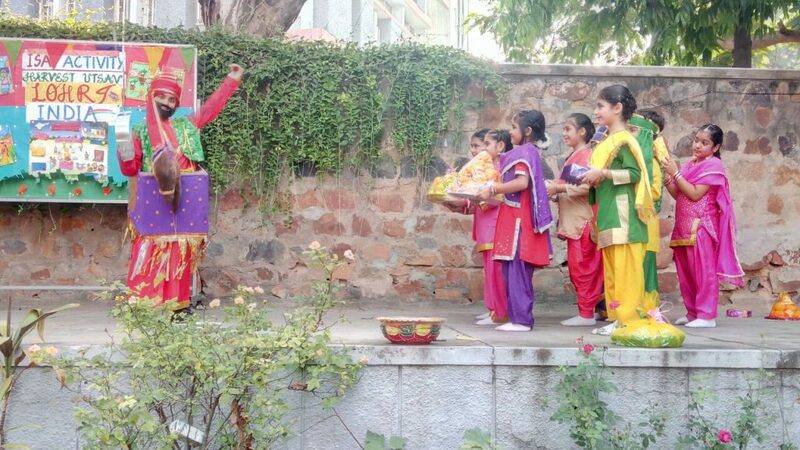 A group of students presented Gidda, the traditional folk dance performed on the occasion. The live ‘Dhol’ performance by Nikunj of Class III A added to the festive mood. 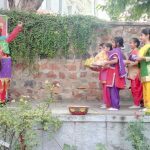 The musical extravaganza was followed by Teacher Talk presented by Ms. Rachna Chaudhary which highlighted the importance of harvest festivals and customs related to Lohri. The assembly was a very joyful and enriching experience for all. Inter House Activities help to develop mental , physical and creative abilities of a child and make him a confident student, who can face challenges positively. To bring the creative skills of the students to fore and to acquaint them with the lives and achievements of Great Women from across the World , an Inter House News letter designing competition was organised for the students of classes VI to VIII on August 29, 2017 under the aegis of ISA Project- Women Achievers . The students were allotted a Country and a Vocation and had to select a woman achiever who satisfied the two criteria. They then presented a creatively designed News Letter which was followed by an oral presentation on the selected illustrious woman achiever. Some of the personalities discussed about in the Activity were JK Rowling – the great Novelist from Great Britain , Maria Sharapova – the Russian Tennis Player , Malala Yousafzai – the Social Activist from Pakistan to name a few. Parents also lent their support by motivating and appreciating the effort. The Newsletters were then displayed at strategic places in the Department . Many students gave their impressions about the activity on the Graffiti. Later the video of the activity was uploaded on the Smart Class which was shown in all classes. This helped the non participants to gain an insight into the trials and tribulations and achievements of these legendary women. A special assembly was organised for the students of the Primary Department, Pusa Road Campus on 22.8.17. 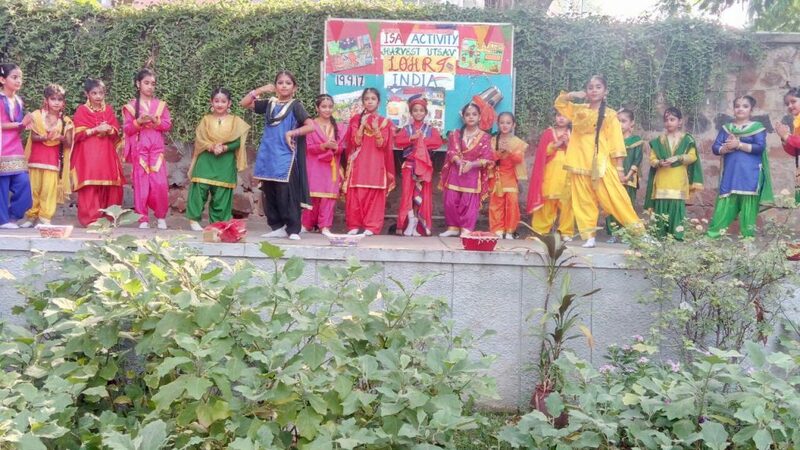 The assembly was a part of the ISA Project- 'Harvest Utsav'. The theme for the assembly was, 'The Harvest Festival of Africa - Homowo'. The assembly commenced with a brief interactive session on the ISA project- 'Harvest Utsav', followed by a musical extravaganza which focused on the festival - 'Homowo'. The participants who were colourfully dressed up as the natives of Ghana showcased the traditions and rituals performed during the festival. They depicted the 'Homowo Parade' in which the Ga people march down the streets of Ghana and cheerfully dance, chant and sing to the rhythmic beats of the drums. The parade was very vibrant and a joyful experience for all. A group of students also performed the traditional African tribal dance- 'Kpanlogo' which is an integral part of the Homowo celebration. The assembly was concluded with Teacher -Talk in which the students were apprised of the traditions and customs related to the festival. The assembly was very informative and an enriching experience for all. 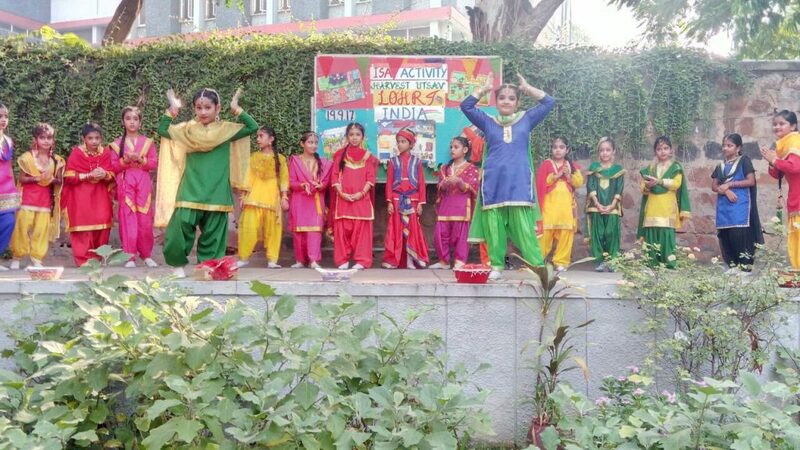 The theme for ISA Project chosen by the Primary Department , Pusa Road Campus this year is 'Harvest Utsav' wherein the students will explore the harvest festivals, 'Lohri' from India, 'Homowo' from Africa - Ghana and 'The Moon Festival' from China. 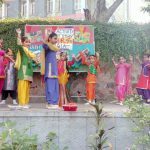 The introductory activity was 'Collage Making Activity' in which the students made attractive and colourful collages and pictorially depicted the festivals. The creative work of the students was displayed on the display boards and runners in the school. A PPT Screening was organised for the students on 24.7.17 and 25.7.17 which highlighted the customs & traditions related to the chosen harvest festivals. As an extension to this activity the students also answered a worksheet on 26.7.17. The activities were a great learning experience for all. A group of 13 students and 2 Teachers (Ms. Poonam Sondhi and Ms Monika Thareja) visited Genoveva Gymnasium, Cologne, Germany from 13 May 2017 to 26 May 2017 for an exchange program. The students prepared PowerPoint presentation, e-graph, posters, cartoon strips,skiton the topic ‘My World in My Pocket - Teenagers and their microphones in Germany and India’. Fifteen students from classes IX-X participated in an educational exhibition, ”Germany-Land of Inventors” organised by Goethe Institut, Max Mueller Bhavan, ND in association with the Frauhofer Institute and the Max Planck Society on 1 February 2017. Students took part in special guided tours of the seven audio stations followed by an interactive quiz session. They got an opportunity to learn about various German inventions across scientific disciplines. The V C began with children identifying the worth of a human being, followed by a discussion on types of human trafficking and the different ways to curb trafficking. Under the aegis of EUmIND, regions 15- an online project brings 13 reputed schools all over Europe and India on one platform to carry out interactions via video conferencing and other sources on various issues of global importance. The project commenced with the creation of Weebly page & individual accounts for all School coordinators. The Home Page is updated regularly & emails are sent out to the schools to keep them posted about the latest developments. At present, the member schools are gearing towards a video conference which will be held soon. A special assembly was held in the Primary Department(GR campus) on 30 September 2016 to celebrate International Peace Day that falls on 21 October. The importance of peace was asserted through a skit and Peace March. Quotes of some famous harbingers of peace such as Mahatma Gandhi, Martin Luther king, Gautama Buddha etc. were also cited. The assembly culminated with students taking a pledge to maintain peace and harmony. A craft activity was organised for the students of Primary department (PR) as a part of the World Animal Day Celebration on 23 September 2016. The activity aimed at sensitising students towards the importance of animals in our lives. Students of class I made animal cutouts using pastel sheets and decorated them with different patterns using thumb printing technique. Students of classes II and III made attractive animal cutouts and masks using paper plates and other decorative material. On 1 October 2016, World Animal Day was celebrated at Primary Department, PR Campus. The programme commenced with a prayer followed by a tabla recital by a student. The highlight of the programme was a Puppet Show presented by students of class II & III depicting the importance of animals in our lives. Through the presentation, children appealed to stop cruelty towards animals and pledged to take care for them. The animal masks and cutouts made by the students during the craft activity organised on 23 September 2016 were showcased through an exhibition. Dr. Sangeeta Budhiraja, an educationist and social worker graced the occasion. The Parents of students of classes II and III were also invited for the event. Senior Department of the school organized Inter House Poster Making competition- Kaleidoscope. The competition focused on UN sustainable development goals such as – Quality Education, Climate action, Gender Equality, Life below Water and Land etc. The competition was adjudged by Ms Soma Ganguly, TGT Art and Ms Neenu Singh, PGT English. First, Second and third positions were bagged by Shivaji House, Abhimanyu House and Jawahar House respectively. Under the programme, students of Middle Department of our school were engaged in a video conference on the Topic ‘Essentials of Dialogue’ with SMP LABSCHOOL KABAYORAN INDONESIA on 31 August 2016. The participants exchanged their views on changes they would like to bring about in their community. They also discussed the impact of faith, values and beliefs on their lives. A discussion on their respective festivals followed and the video conference ended with students sharing their learning outcomes. On 1 August 2016, members of Children for International Community Club in the Primary department held an exhibition on the theme ‘Architectural designs of the world’ depicting architectural splendour and magnificence of the monuments of different countries, namely, India, Japan, Germany, Italy, France, Russia and China. The activity provided an insight into the history, significance and glory of some the prominent monuments of the world. Under the aegis of BRIDGE – India Australia School partnership program, a rewarding exchange of traditional art forms took place between our school and Singleton High School, NSW, Australia. Through a series of video conferences and under the able guidance of Ms Soma our students learnt and practiced Aboriginal Art – Australia’s Folk Art form. The young artists reveled in the colourful expression and polished their artistic skills by using the creative form to paint the boomerangs sent by the partner school. They also showcased their competence by painting planters, folders, bookmarks, masks, mirrors, cards etc. Using Australian aboriginal Art form. As a part of this creative exchange our students taught their counterparts the Indian Art form-Madhubani. These interactions provided a useful platform to the students to share ideas and collaborate while learning with a structured and a constructive approach. Goethe Institut, Max Mueller Bhavan conducted two youth camps in summer vacations for German learners from India, Sri lanka and Iran. Youth Camp in Sri Lanka (28 May-4 June 2016)- Kunal Dhawan of class (VIII A) participated. Regional Summer Camp in Kerala (25 June – 1 July 2016) - Charvi Sachdeva (VIII A) and Anushka Mittal(VIII A) participated. The camps provided the students, a platform for cultural exposure and an opportunity to refresh German language skills through activity oriented language classes. Six students along with a teacher got an opportunity to participate in the National Anthem ceremony at T-20 Cricket World Cup on 26 May 2016 at Ferozshah Kotla Cricket ground. They students participated in the Anthem ceremony of Ireland vs Australia Women’s Team and England vs. Srilanka Men’s Team. The second phase of the yearlong Robert Bosch Project culminated with a 14 member delegation from BBPS,GR visiting Cologne, Germany from 21 May to 3June 2016. The students and teachers were hosted by their counterparts from Genoveva& Maxmillan Gymnasium, Cologne. During their stay students worked collaboratively on assigned activities from year long project – ‘Conceptions of happiness in Germany & in India’. The students created Power point presentations, collages, videos & plays and uploaded them on the PASCH platform. The delegation visited Cologne Museum& Chocolate Museum; enjoyed river Rhine cruise and amusement park-Fantiazialand, castles and other places of interest. The teachers had an opportunity to visit a Primary school as well. Indian students performed a Rajasthani Dance in the Formal Farewell ceremony organized for the delegation on the last day. The programme provided the students and teachers with first-hand experience of the German way of life and culture. Students of Astronomy Club participated in Global Astronomy Month (GAM) 2016 activities organized by Astronomers Without Borders (AWB). The activities included Astro Poetry Contest, Astro Art Contest, International Earth & Sky Photo Contest, International Dark Sky, Global Star Party, Moon Watch, Art Exhibition & Safe Solar Observation. Our school has been declared winner in two categories namely, ‘Maximum Number of Activities Conducted’ & ‘Most Innovative Event’. Riya Khanna (XII A) was adjudged II in the International Astro Art competition.The school was also declared winner in the ‘Most Innovative Event’ category during GAM 2015 in the session 2015-16. A group of 12 students of class VII to XII, escorted by the Tour In-charge, Ms Nita Nijhara, visited Australia for a 10 days / 9 Nights trip organized by Edterra Edventures. The enriching itinerary familiarized students with flora, fauna, culture and heritage of the country through visits organized to places such as, Great Barrier Reef: Opera House; theme parks- Sea World and Movie World; Kuranda Village in Cairns ; Sea Life Aquarium etc. The visit to the University of Sydney, the first university of Australia showcased their teaching and research excellence to the group. In the 6th International English Olympiad Level II, organized by Science Olympiad Foundation (SOF) Harjot Singh and Hridaey Hari Kalra of class II secured the First Rank at the State Level and were awarded the International Gold Medal each. Kriti Yadav and Vidushi Jain of class III were felicitated with an International Silver Medal each for securing the Second Rank at the State Level. Himanshu Kandpal of class IV scored the first rank at State Level in the 9th SOF International Math Olympiad Level II, organised by Science Olympiad Foundation. He was bestowed the Gold Medal of Excellence. Students have been selected to work on the following alloted projects under EUmIND in session 2016-17. On 12 April 2016, Principal, Mr. L.V. Sehgal was interviewed by Ms. Irina Biovir-Idier, Head of Communication and Sponsorship, Embassy of France in India regarding teaching methodologies being followed for French language at the school. This was followed by an observation and video recording of the French lecture on the grammar topic “La Nègation”, in X G. Video shoot of the school campus and of the interview conducted of French learners was also carried out. The entire recording will be soon telecast on TV5 Monde, a French channel aired all over the world. On 25 April 2016, students of Middle Department of our School were engaged in a dialogue with the students of the following schools via a Video Conference on the topic Environment. Students from each school expressed their thoughts on what they thought were the most important environmental issues in their regions. They discussed the importance of environment in context of culture and religion of their own country as well of other countries. They quoted instances that they had found particularly inspiring or empowering from other religions and cultures. Vice Principal, Ms Geeta Gangwani attended the PASCH Principal's Conference South -Asia held on the topic “Dynamism and Pro-Activity through School Leadership” in Kuala Lumpur, Malaysia from 22 to 23 January 2016. The school hosted PASCH University Fair on 29 November 2015. In the inaugural programme, Mr L V Sehgal, the Principal extended a formal welcome to the dignitaries from Max Mueller Bhavan. The Fair consisting of representatives of ten prominent German Universities besides “DAAD” (German Academic Exchange Service) showcased relevant information on Bachelor Studies courses available there. Information regarding educational opportunities, admission procedures, required qualifications, etc. was made known to students besides answering their individual queries. Max Mueller Bhavan, ND organised a cultural programme to mark 10 years of Indo-German School Partnership on 21 November 2015. The event was organised for teachers and students of schools engaged in Partnership Projects. Ms Sabina Chowdhary and Ms Deepika Bhasin, Project in-charges, from the school along with the visiting German delegation from Genoveva Gymnasium, attended the programme which highlighted the importance of exchange programmes as valuable learning experiences. The school is proud to be associated with the year long ‘German-Indian Classroom Programme’ – initiated by Robert Bosch Stiftung and Max Muller Bhavan, New Delhi- for the fourth consecutive year. The project topic for this year is “Happiness-Conceptions of a Fulfilled Life in India and Germany”. The project started with the selected students sharing introductory e-mails with their German partners. Further, the students have begun their research on different concepts of happiness and their importance. They have prepared collages, videos and questionnaires on the basis of their findings and discussions. The 11-member delegation consisting of 9 students and 2 teachers from EKOS Poznan, Poland paid a reciprocal visit to the school from 14 to 22 November 2015, as part of the Europe Meets India (EUmIND) Project. The Polish students and teachers stayed with their host families and got first-hand experience of Indian culture and family set up. 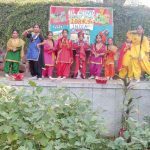 They also got an insight into Indian education system when they attended curricular as well as co-curricular classes in the school. The delegation also visited the Taj Mahal in Agra and Red Fort in Delhi. A farewell ceremony was organized for the visitors in which the Polish students along with their Indian counterparts presented a colorful Rajasthani dance. Ms Meena Malhotra, Headmistress, visited Australia from 16 to 25 October 2015 under the Australia-India BRDGE School Partnership programme which consisted of a three day joint professional learning programme and seven days home stay as well as school visit. The learning programme focused on personal relationships, building inter- cultural understandings and strengthening the use of ICT in learning and teaching. Creating groups, sharing goals for collaboration and a range of technologies that support student collaboration were also discussed.